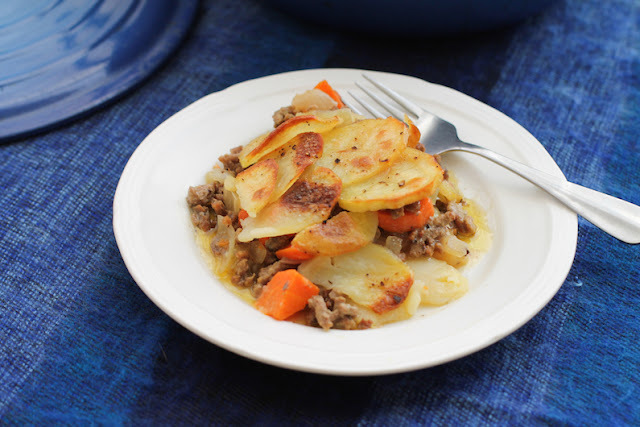 This untraditional recipe uses ground lamb cooked with carrots, onions and thinly sliced potatoes, for an inexpensive, quicker-to-the-table version of the classic Lancashire hotpot. 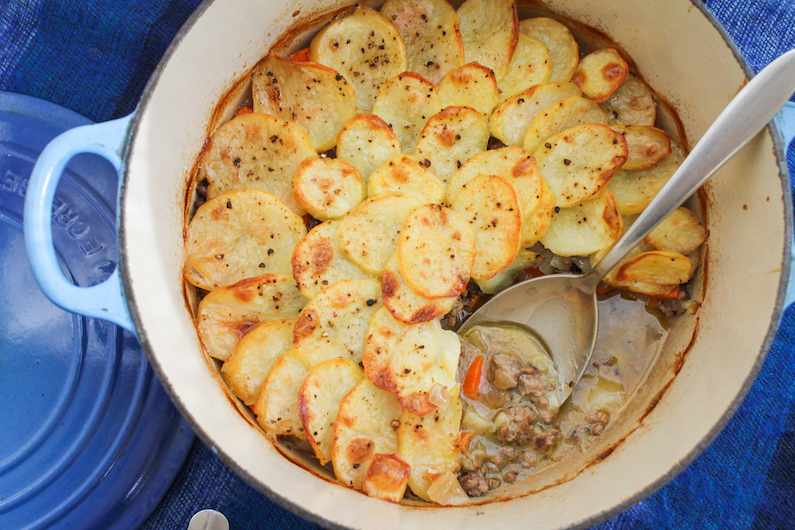 Lancashire hotpot is a hearty dish from the northwest of England, made from some of the less expensive cuts of lamb cooked long and slow until they are tender. This is a great family meal on a chilly night when the heat of the oven is a comfort and we all need something warm in our bellies. Browning the ground lamb until it turns crispy deepens the flavor of the gravy that is created with the added stock as the hotpot bakes. My untraditional version uses an even cheaper cut, ground or minced lamb, which since it’s already tender, also shortens the cooking time. 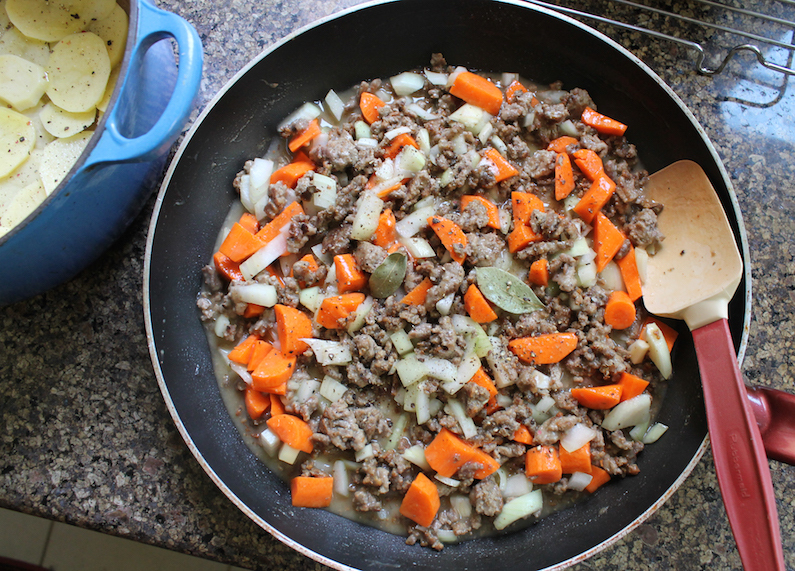 If you can't find ground lamb or you simply aren't a fan, substitute beef or pork. Brown the ground lamb very well, until it’s a little crispy on the edges, adding a little of the olive oil if the lamb is dry. 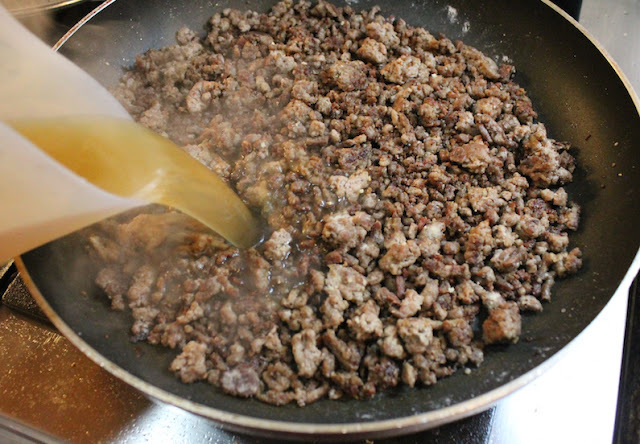 Some ground meat contains more fat than others, depending on which cuts the butcher has included in the mix. 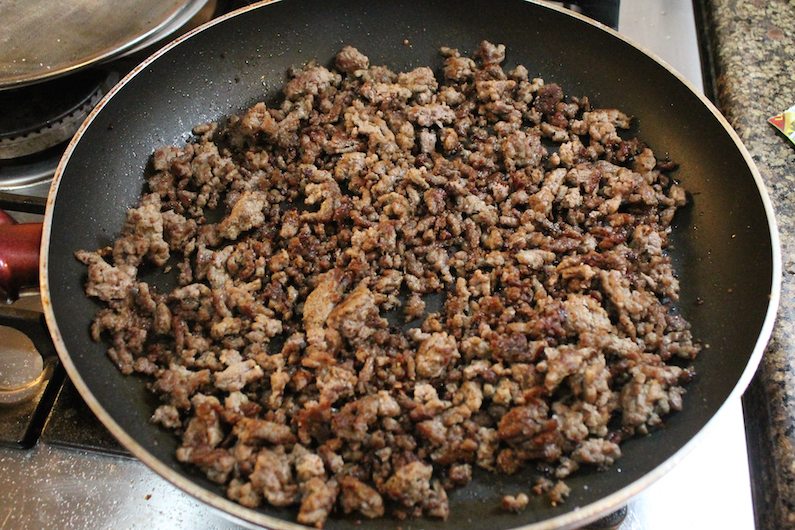 Once the meat is well browned, sprinkle in the flour. Cook a few minutes more, stirring well. Turn the heat off and stir in the stock. Add in carrots, onion and bay leaf. Grease your Dutch oven with some of the olive oil. 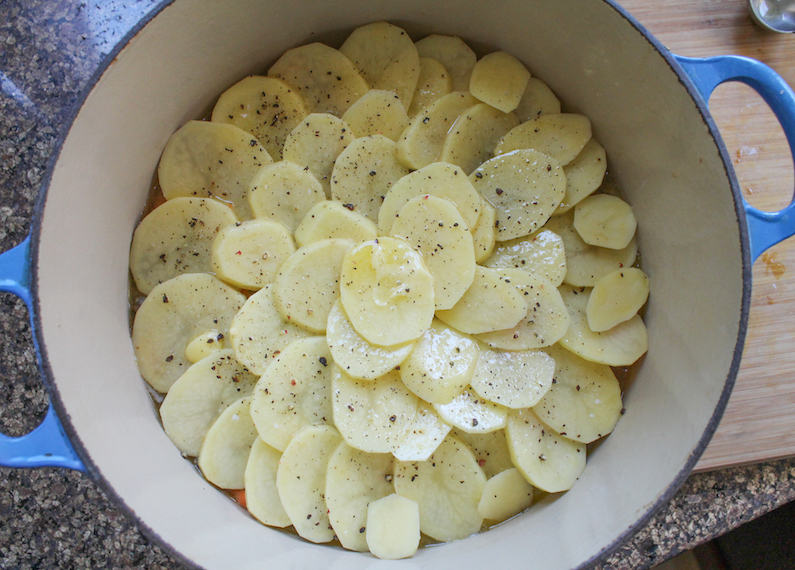 Line the base with potato slices then season them with salt and pepper. 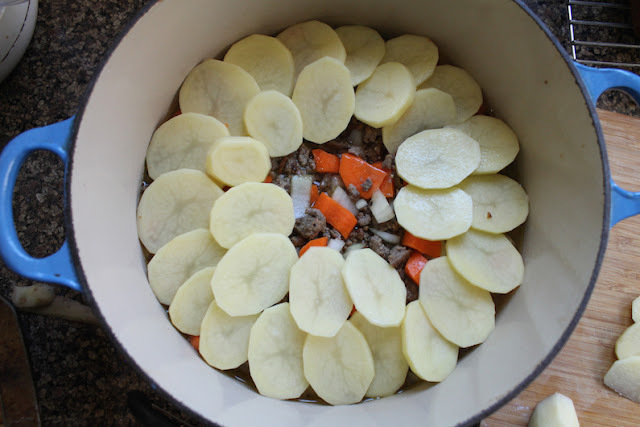 Spoon the ground lamb mixture on top of the potatoes. Top with the rest of the potato slices. 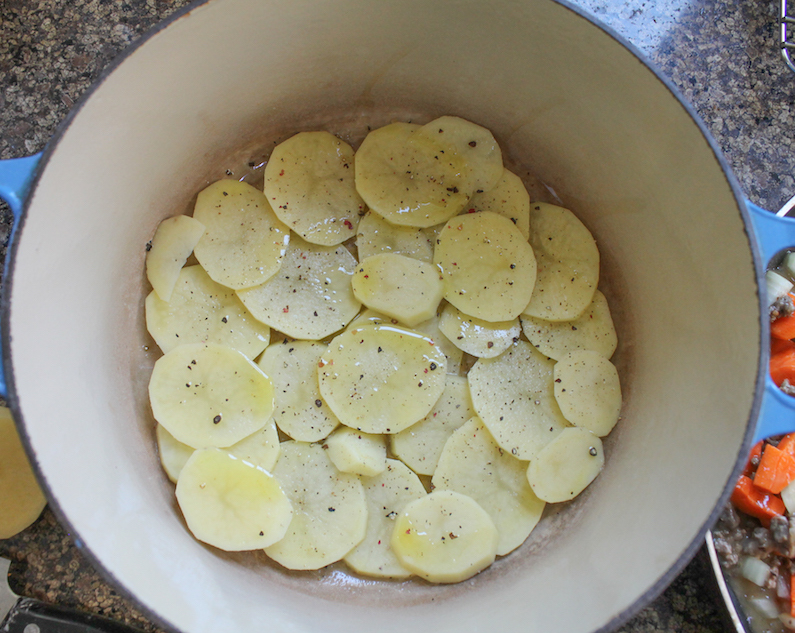 Drizzle the potatoes with melted butter and season with salt and pepper. 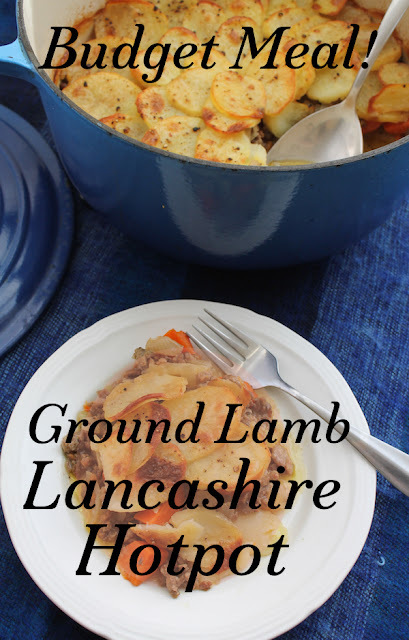 Cover the Dutch oven with a tight-fitting lid and cook the ground lamb Lancashire hotpot in your preheated oven for 30 minutes or until the potatoes are tender. Remove the lid and cook another 20-30 minutes so the top can brown. If it is not browned to your satisfaction, you can put it under the broiler (Br. Eng: grill) for 5 or 10 minutes to brown further but do keep a close eye on it so it doesn’t burn. We eat a lot of lamb at our house. If you are also a fan of lamb, you might want to check out these other recipes, all family favorites. 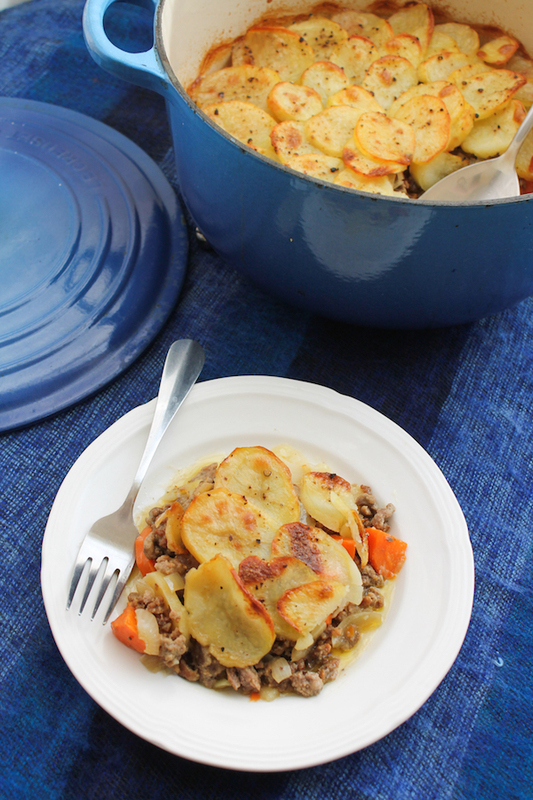 Irish Lamb Stew - perfect for St. Patrick's Day!